Maybe we're going to see some robot humility. 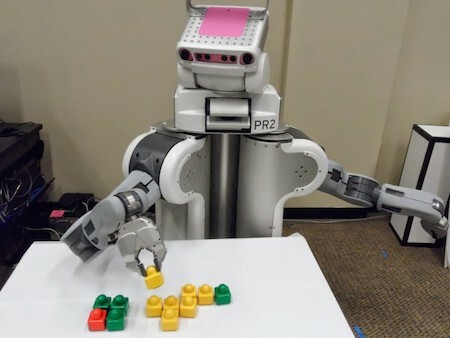 A University of Washington team is working on a way for robots to go online and ask for help when they are puzzled. Learning by imitating a human is a proven approach to teach a robot to perform tasks, but it can take a lot of time. Imagine having to teach a robot how to load the dishwasher -- it might take many repetitious lessons for the robot to learn how to hold different types of cookware and cutlery and how to most efficiently fill the machine. But if the robot could learn a task's basic steps, then ask the online community for additional input, it could collect more data on how to complete this task efficiently and correctly. The research team, led by professors Rao and Cakmak, also includes UW computer science and engineering graduate student Michael Jae-Yoon Chung and undergraduate Maxwell Forbes. The team designed a study that taps into the online crowdsourcing community to teach a robot a model-building task. To begin, study participants built a simple model -- a car, tree, turtle and snake, among others -- out of colored Lego blocks. Then, they asked the robot to build a similar object. But based on the few examples provided by the participants, the robot was unable to build complete models. To gather more input about building the objects, the robots turned to the crowd. They hired people on Amazon Mechanical Turk, a crowdsourcing site, to build similar models of a car, tree, turtle, snake and others. From more than 100 crowd-generated models of each shape, the robot searched for the best models to build based on difficulty to construct, similarity to the original and the online community's ratings of the models. The robot then built the best models of each participant's shape. "... whenever a robot finds something it can't identify straight off... it puts whatever it is in the hopper outside your window. You give it a good look, check the list for the proper category if you're not sure, then press the right button and in she goes." An hour passed before he had his first identification to make. A robot stopped in mid-dump, ground its gears a moment, and then dropped a dead cat into Carl's hopper... Something heavy had dropped on the cat, reducing the lower part of its body to paper-thinness. I should also mention Ava learning software from The Calcutta Chromosome, a 1995 novel by Amitav Ghosh. In the story, Ava is an artificial intelligence program that has human help in identifying objects.